What causes the facing-the-viewer bias? How do we construct a coherent interpretation of the world when incoming data are often incomplete, noisy, and ambiguous? What guiding principles are used by our visual system in order to create such a reliable ‘reality’? These questions, and more, have guided recent research at the BioMotion Lab. In our lab we often use minimalistic representations of humans in motion (‘biological motion’ stimuli) to ask how we perceive when stimuli are inherently ambiguous. Look at the point-light walker in this BMLWalker Demo. Is the walker facing you or is it facing away from you? Most observers would see the walker facing the viewer – even though the stimulus itself does not contain any information whatsoever as to what the answer to the above question is. The stimulus is completely devoid of any depth cues. A person that consists of only a few small dots with everything else being invisible would generate the very same image when seen from the front as when seen from the back. Depth ambiguous representations of human figures can be perceived in different configurations. The figure below demonstrates two types of such representations. 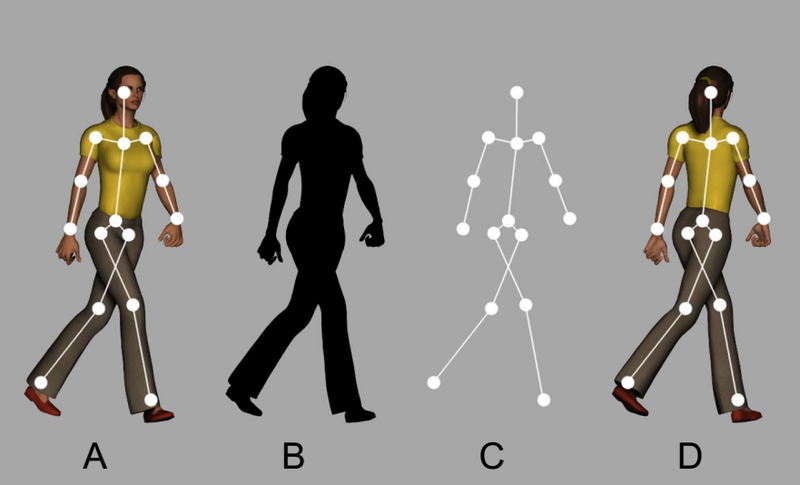 The silhouette, B, and the stick figure, C, correspond precisely to both the human figures depicted in A and D. The stimuli shown in B and C can be interpreted as corresponding to either the ‘facing towards’ or ‘facing away’ configurations because the depth-ordering of the features in each representation is ambiguous. With stimuli like the one shown in C, observers are biased to perceive the stimulus facing towards the viewer (that is, C is more likely to be perceived as representing the person in A rather than D). This is known as the ‘facing-the-viewer bias’. Why then do we perceive the walker as facing us rather than facing away? There are a at least two possible answers to that question and our lab is right at the centre of the debate which one is correct. Literally! The divide between the two theories goes right through the lab. Compare Adam Heenan’s paper in PLoS ONE to the paper by Seamas Weech which appeared today in the Journal of Vision. We thoroughly recommend reading both articles and comparing the conclusions reached in each paper if you are interested in understanding the crux of the matter. The conclusion: Both theories are correct to some degree. One cause for the facing-the-viewer bias, however, seems to be much more prominent than the other. Find out which it is. It has been suggested previously that the facing-the-viewer bias might exist for sociobiological reasons: Mistaking another human as retreating when they are actually approaching could have more severe consequences than the opposite error. Implied in this hypothesis is that the facing-towards percept of biological motion stimuli is potentially more threatening. Measures of anxiety and the facing-the-viewer bias should therefore be related, as researchers have consistently found that anxious individuals display an attentional bias towards more threatening stimuli. In our experiments, we found that physical exercise and progressive muscle relaxation reduced facing-the-viewer biases when participants observed full point-light displays, but not when they observed only partial displays that also exhibit facing-the-viewer bias. The results provide further support that the facing-the-viewer bias for biological motion stimuli is related to the sociobiological relevance of such stimuli. Research has shown that a sociobiological explanation cannot explain a variety of findings related to the facing-the-viewer bias. Instead, it has been suggested that some low-level stimulus properties of the point-light displays influence observers’ judgments of in-depth orientation. In this study, we examined perceptions of a series of depth-ambiguous stick figures and silhouettes to determine the stimulus properties that influence judgments of facing directions. Results of our first experiment indicated that silhouettes do not elicit facing-the-viewer bias, whereas almost all stick figures that were tested produced strong biases. We hypothesized that the ambiguous surface normals on the lines and dots that comprise stick figures are prone to a visual bias that assumes surfaces to be convex. 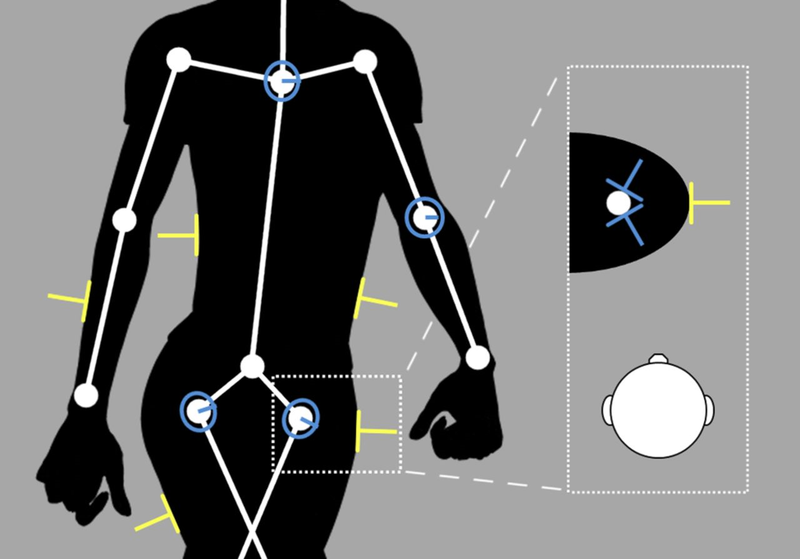 We tested this idea in our second experiment by adding dots to the elbows and knees of silhouettes, and found biases consistent with the facing directions implied by a globally convex body surface. The findings support the hypothesis that that the facing-the-viewer bias is established at the level of surface reconstruction from local image features rather than on a semantic level. The silhouette illusion published online in 2003 by Japanese Flash designer Nobuyuki Kayahara has received substantial attention from the online community for many years. One feature that seemed to make it interesting was an apparent rotational bias: Observers see it spinning more often clockwise than counter-clockwise. In this study, we showed that this rotational bias is in fact due to the visual system’s preference for viewpoints from above rather than from below. The movie demonstrates the depth ambiguity of the silhouette in the centre. That silhouette can be interpreted in two ways. The two interpretations differ in the perceived order of the surfaces of the body in depth as can be seen in the figure below the movie. The left column illustrates the interpretation in which we look at the figure’s back in the first frame (top). The figure then rotates clockwise as we go though the sequence of frames (from top to bottom). Note, that we also look at it from a slightly elevated viewpoint (10 deg). In the right column we illustrate the other interpretation. We look at the front of the figure in the first frame, the figure rotates counter-clockwise, and the viewpoint is 10 deg from below. The two interpretations differ from each other in terms of a mirror reversal about the image plane.